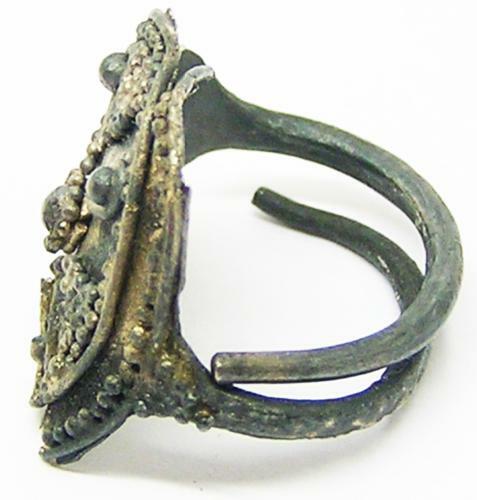 This is a rare Anglo Saxon silver finger ring, dating to the 8th - 9th century A.D. The ring is a complex piece of jewellery, formed from a rod of silver, hammered, drawn with the terminals tapered (to enable the ring to be resized). The bezel decorated with an elaborate pattern of granulation and wirework set out in a cruciform design. The fabric of the ring is brittle, clearly of the same alloy as used in the silver coinage of King Offa and Alfred the Great (which also displays the same 'chippy' appearance and brittle edges). The cruciform design on this ring is also similar to that found on the reverse of various silver pennies of both Kings. Similar Saxon finger rings in gold with granulation have been recorded ESS-FA05C2, SWYOR-3B5652, with another brittle silver example YORYM-CB6717. Thus this ring, in my opinion, dates to the period of Alfred the Great or Offa. DATE: c. 8th - 9th century A.D.